We often get asked by architects and builders how they can specify double glazing. It’s easy – you can specify double glazing in exactly the same way you would specify any other new windows or doors. Double glazing is a system of insulation using two panes of glass with an air gap (also known as an insulated glass unit or IGU). The sealed air gap and extra pane(s) of glass create additional insulation to reduce the effects of noise and heat transfer. Different combinations of glass and glass thickness in the IGU are used to manage direct solar heat gain and noise. Tinted, reflective, low-E glass and/or acoustic glass can be used in combination to achieve thermal and acoustic objectives. IGUs are a significantly more energy efficient glazing system than single glazed windows. More and more, property owners are looking for homes that are sustainable and energy efficient. Double glazing can provide numerous benefits for both of these requirements. Double glazing significantly reduces incoming/outgoing heat. Less energy is used for heating and cooling resulting in lower energy bills. Significantly reduces incoming and outgoing noise. IGUs are tougher to break than single pane windows. Double glazed window frames and sashes are more robust resulting in reduced wear and tear and increased longevity. Double glazed windows reduce the amount of UV and heat entering the room. This can help reduce sun damage to artwork, furniture, carpet, and other objects around the home. As Winsulation customises all of our products to meet the exact demands of the client, all we need is relevant information that can casuist us in designing and manufacturing the right glazing combination and frames for your project. > Relevant climatic conditions of the building location including amount of sunshine, humidity and wind. Coated glass – Low-E: offers a higher level of energy efficiency. Low-E glass is made by applying a thin layer of metal compounds during or after float glass manufacture. Toughened safety glass: is 4 to 5 times stronger than ordinary float glass. If broken, the whole panel of glass shatters into smaller pieces of blunt granules. Laminated safety glass: is made by laminating two or more sheets of glass with a flexible plastic based interlayer or PVB. Different interlayer and glass combinations can provide safety, noise reduction, security and climate control benefits. Toughened laminated glass: is most commonly used in high wind load areas or to prevent penetration of flying objects in extreme storm events. Patterned glass: provides a degree of privacy by diffusing the object rather than obscuring. Thermeco Thermal Break aluminium utilises a separating polymer resin situated between the inside and outside of the frame and the sash. 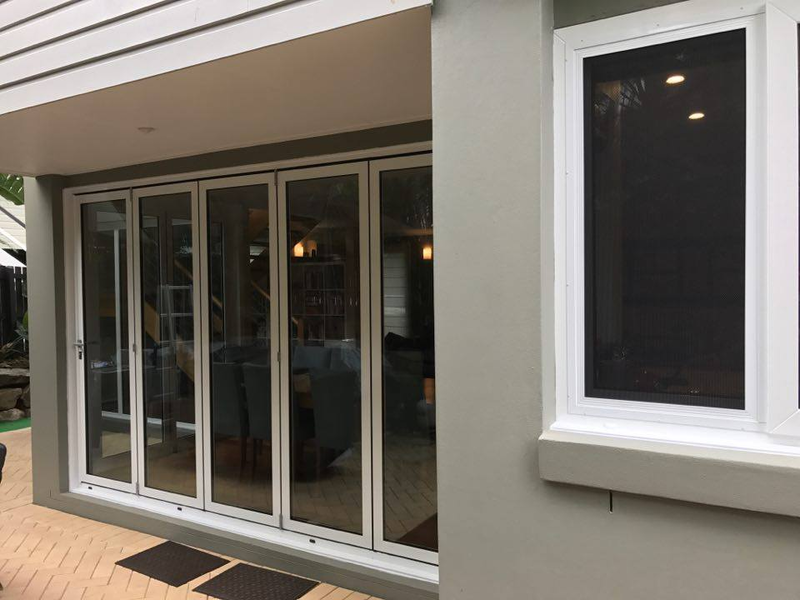 The aluminium window / door frame and sash are designed to counteract the material’s normal high conductivity rating for both noise and temperature. uPVC (Unplasticised Polyvinylchloride) is a highly resilient material used extensively in construction, transportation, electronics and health. uPVC is a natural insulator and easily recycled. U-Value: the rate of heat flow through glazing by conduction, convection and re-radiation. SHGC (solar heat gain co-efficient): the total amount of solar energy transmittance entering a building through the glazing as heat gain. The darker the glass the more effective a window will be at lowering the SHGC, but the trade off will be reduction in natural light. This will impact on artificial lighting considerations. Varying the glass thickness between panes and glass is important as this helps to deal with various frequencies.The loudness (dB) and pitch (Hz) of a sound taken together determine their impact on our acoustic comfort and what steps we can take to manage it. Previous Previous post: Don’t Compromise Your View!